Due to a height restriction at their garage in Walnut Street, Halifax, Hebble had always purchased lowbridge double deckers, and their first two Regent V’s (75/76, GCP 4/5) of 1956 carried lowbridge Weymann Orion bodies. However, by early 1957 the northern end of the garage had been modified to accept conventional highbridge buses and so the next double deck deliveries were the first of this layout. As with the previous pair they were AEC Regent V’s of the D3RV variety, with the A218 9.6-litre engine from the Mk. III and vacuum brakes, but with Weymann Orion H33/28R bodies. 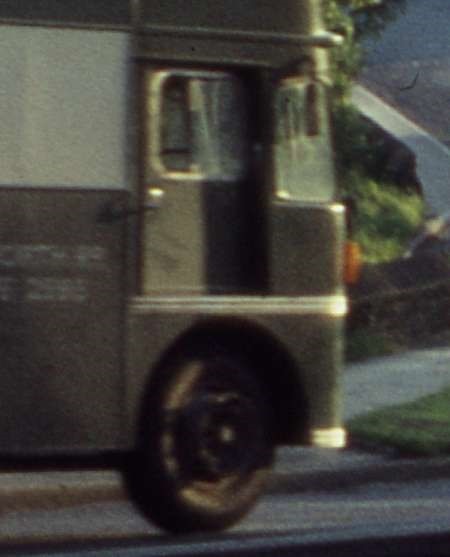 On delivery in March 1957 they were the last vehicles to be numbered in the original fleet number series (81-83, GJX 845-847), but by June a new numbering scheme had been introduced and they became 301-303. They were still unable to pass through into the lower section of the garage and after a few incidents it was decided that highbridge vehicles should have their radiator cowls painted in cream, as well as having cream steering wheels as a warning measure. They were half a ton lighter than the two lowbridge Mk. V’s and were consequently very potent performers, producing the most amazing growling sound effects from their straight-through exhaust systems. They also initially had exhaust brakes which added an impressive cacophony of clicking, hissing and booming sounds whenever the brakes were applied, and I’m sure that many Hebble drivers drove them to exploit these effects to the maximum – I know I would have done ! I believe that at first 301 and 302 were initially allocated to Bradford Park Lane garage to operate Hebble’s share of the 64 Bradford-Brighouse-Huddersfield, as I saw them only occasionally in their early days passing our house at Stump Cross, Halifax, but 303 was based at Halifax and quickly became a regular sight on the 7/17 services to Bradford, and was a favourite for operating the very fast-timed Saturdays-only 29 ‘Wibsey Flyer’ to Bradford via Wibsey. After these Hebble switched to forward entrance Mk. V’s and the cream front cowls continued to be applied for a while, but by 1960 they had reverted to red. Originally in red with a single cream band above the lower deck windows, they later had the cream extended around those windows, then following the delivery of their first and only new Fleetline in 1966 cream was also applied around the upper deck windows too, as shown in the photo above. The fleetnames were originally of the block capital style with the middle letters undelined, but later an italic style was adopted. 301 was withdrawn in April 1970, but 302/303 survived a little longer to be renumbered into a Yorkshire Woollen-based series as 600/601, 600 being withdrawn in December 1970, but 601 lasting until the end of Hebble’s stage service operation in March 1971. All passed to the dealer W. North of Sherburn-in-Elmet, but by this time Hebble’s maintenance standards had sunk to an all time low and they found no further buyers other than the scrap man. A sad end to some most impressive buses. I’ve just realised I made an error in the copy. 81-83 were not numbered in the original series, which had commenced at 1 in 1924 and reached 190 by 1947, whereupon a second series reverted to 1 again and reached 83 with these Mk. V’s. (Eight second hand Tiger TS7’s and TS8’s from Yorkshire Woollen District were tagged onto the original series as 191-198, presumably as they were not intended to stay long). Hebble was a bit of an anomaly in that although a BET operation it was much smaller than the municipal operators with which it co-existed. Halifax, Huddersfield, Bradford and Leeds were all much larger and shall we say more prestigious operations than Hebble. Probably not surprising that in the end it was swallowed up by Halifax although some of the coaching operations went to Yorkshire Woolen if I remember rightly. I have long wondered why the National Bus Company subsequently allowed the engineering standards at Hebble to degenerate to a point where the vehicles were operating in a state that bordered on, or in some cases, actually attained, the dangerously illegal. GGH refers to some truly hair raising (though, sadly, not for me, nowadays) examples of Hebble maintenance, or the lack of it, that emerged on HPTD taking over the company in 1971. From 1968, NBC inherited the nationalised element of the Halifax Joint Omnibus Committee, plus the entire Transport Holding Company and BET interests in Hebble. Why then did it wait three years during which time Hebble suffered inexcusable neglect before offering the business to Halifax? Were there some political sensitivities to smooth over, such as the possible wounds to civic pride in Leeds and Bradford, that might have arisen with the arrival of Halifax operations in those cities? I am sure that John’s remarkable understanding of the wider scene will furnish some answers. 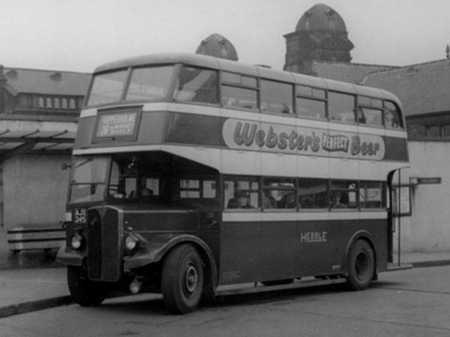 Before the takeover by Halifax in 1971, some Hebble routes based on Bradford had been transferred to West Yorkshire Road Car (WYRCC), including the Bradford – Huddersfield service 64. 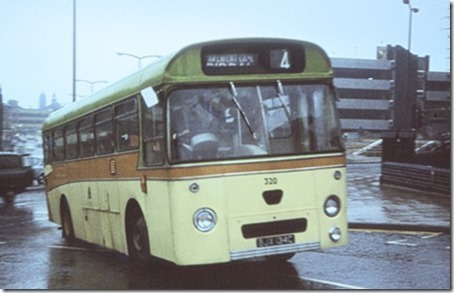 In 1972, Calderdale JOC (the undertaking formed by the merger of Halifax and Todmorden JOCs) transferred one bus working on the former Hebble Bradford – Brighouse route to WYRCC. At the same time, to replace the loss-making ex-Hebble Halifax – Bingley service, WYRCC reorganised its own services in the area. These changes were partly a response to NBC’s claim that Halifax had taken over so much of Hebble. The JOC’s report had even envisaged the possibility of WYRCC participating in the former Hebble Halifax – Leeds service, but this did not happen. In terms of injured pride in Leeds and Bradford. Bradford used to have joint services with Hebble while the services to Leeds had limited pick up and set down rules. When Calderdale took over the rules continued so there was no loss of traffic but Leeds. If I remember rightly – its a long time ago but maybe mid 1970s – the Leeds – Dudley Hill – Halifax service, formerly 8 but later 508, became operated by Leeds’ Bramley depot. So parochial had LCT’s western operations been up to then (apart from the 72 joint with Bradford CT) that those venturing to Halifax were looked on with the reverence usually reserved for spacemen and the like!! Chris H may have more accurate information?? Roger, I’m afraid my ‘understanding of the wider scene’ does not extend quite as far as you may imagine ! Call me shallow and a bit of a philistine but I have never found the inclination to be that interested in the political machinations that take place both within the industry and between it and national and local government. I tend to be more grounded in the ‘what actually happens on a day-to-day basis’ and ‘how it happens’, than the ‘what ought to happen’ and ‘why it happened’. It’s probably for that reason that it was fortunate that I never progressed into a management career, as I would most likely have become quickly disillusioned and depressed ! Therefore I cannot really offer much in the way of an explanation as to why the NBC took so long to part with Hebble. Through most of its existence Hebble had directors who were also on the board of Yorkshire Woollen, and the two worked closely together – particularly with regard to coaching, and occasionally lending one another staff. In the last year or two of Hebble’s existence the NBC brought them closer together, the vehicles adopting YWD’s red livery and the vehicles being renumbered in a 5xx/6xx series within the YWD numbering scheme. There was a certain exchange of services, with Hebble’s share of the 64 Bradford-Huddersfield passing to West Yorkshire, and I imagine that all this was seen as the precursor to an eventual absorption of Hebble into YWD, in the same way as Mexborough & Swinton was absorbed by Yorkshire Traction, and Stratford Blue by Midland Red. However YWD themselves were seriously struggling in the late 1960’s with vehicle maintenance and the ability to operate a full service and so they had more pressing matters to concentrate on. The BET group had always retained those smaller companies mentioned, apparently to provide a means of allowing up and coming trainee managers to hone their skills with a smaller unit before progressing to greater things. Hebble was ideal for this purpose as it operated local stage, express, excursion and tour services, and several well known (in their day) managers of larger BET/NBC companies had at some point done their stint with Hebble. I always felt sorry for Hebble’s last manager – David Dickinson – who suddenly found himself dumped at Halifax with the unenviable, nay impossible task of managing a company that must have seemed to be gasping its last breath before drowning in a quagmire. There had been occasional talk in the local press since the late 1960’s of the possibility of a takeover by Halifax JOC of Hebble services, mostly put about by Halifax GM Geoffrey Hilditch himself. Some of his newer buses even had ‘Bradford’,’Wakefield’ and other destination included on their blinds, but I suspect that other parties to a possible deal may have regarded Hilditch as a bit of a ‘cocky and ambitious upstart’ and did not want to see him getting his own way and ruling the roost. I may be wrong about that, but I did work under him and know what he was like. Regarding Chris Y’s comments about the 508 Halifax-Dudley Hill-Leeds (let’s quote it the right way round, Chris !). Leeds’ Bramley Depot came onto the route when it was extended across Leeds City Centre from King Street to the Central Bus Station. They provided two buses, with Calderdale (Halifax) providing the other three. Bramley drivers quickly developed an appalling reputation for running early, especially in the evenings, and having a generally bad attitude. I worked permanent late duties on the 508 for a few years during this period and regularly observed them passing in the opposite direction up to 20 minutes early on many occasions, and probably hundreds of people were left behind over the years – most never having even seen the bus go by and having just assumed it had been cancelled. When it was decided (rather foolishly, as it turned out) to extend the 508 beyond Halifax westwards out to Rishworth, for the unadventurous Bramley drivers it was the last straw and they would have none of it, so Calderdale drivers got the whole service back to themselves again. The Rishworth extension was not a success and it was soon cut back to its original form, but Leeds were never invited back on again and to this day, though now operating into Leeds via Farsley and Kirkstall, it is still 100% First Halifax worked. John, You didn’t miss out much by forgoing a management ‘career’. Much of mine was spent with LCBS, its forebears- not too bad generally, but its successors became an entirely different story. With the fracturing of the established companies in preparation for privatisation, things became very nasty at times as certain people used every stratagem available to secure their futures under the new order. I was glad to get out of Kentish Bus at the end of 1987, and resolved never again to seek a bus industry management post in the cut-throat private ownership environment. Back to Halifax. Yes, I too can well appreciate the existence of a level of scepticism at NBC about Geoffrey Hilditch, who never disguised his "Greater Halifax" aspirations. This might have influenced NBC to hang on to the rump of Hebble until its survival became perilous, but the neglect of the company was utterly disgraceful. Independent operators would have had their operating licences revoked if engineering maintenance had declined to the dangerous state that existed with Hebble. Turning to the unreliable Leeds element in the joint operations with Calderdale, this does illustrate a weakness that often arises in supervision standards when two different participants are involved in a route. Did the Calderdale inspectorate not have authority over the Leeds staff on the joint operation? Thanks John for a wealth of interesting information about the 8/508 service, and by way of humble excuse I must admit that I was reading my compass wrong way round when I described the terminal points in the order that I did. As regards early running I sadly have to say that in LCT/Leeds Metro District days this crime was by no means confined to Bramley depot – the same was widespread at Seacroft, Middleton, Sovereign Street, Headingley and Torre Road as well. This meant that the conscientious folks were doing all the work while the work shy element had an easy time, and of course the passengers suffered as a result. To a very large extent the satellite tracking system of modern times has virtually eliminated early running and a good thing too. Roger – your last sentence raises a most interesting point regarding joint operation of a service. The old established 72 service from Leeds to Bradford was shared by Leeds City Transport and Bradford City Transport and the inspectors of either could supervise any bus and it worked very well indeed. As an enthusiast I quite often, if on the area, took advantage of this to check superb Bradford buses. The silent recommendation though was that the inspectors of each operator would more or less stay local normally. I recall one occasion when I slipped up badly – I boarded a "Bradford blue" on the Leeds Ring Road at Wortley and on the front seat upstairs was an obnoxious character claiming that he couldn’t find his ticket. I "smelt a rat" and insisted that he did and in turning out each pocket, deliberately slowly, he produced an astonishing array of old rubbish and battered tickets galore – but no valid one. A further rumpus occurred as he finally realised he was going to have to pay again and by the time I’d seen to that – I’d been totally engrossed in the case – I realised to my horror that the bus was at Laisterdike within a mile or so of Bradford. I should add that checking the Bradford tickets was a bit of a nightmare anyway as they were still using low value Ultimate tickets even on such long routes. Now the Leeds Chief Inspector of the times was an unreasonable tyrant and used to forensically examine our checking sheets in the hope of finding something to "nit pick" about, but mercifully my delightful "away day" trip went un-noticed for a change." Halifax inspectors certainly had authority over Leeds drivers within Calderdale, and similarly Leeds inspectors could – and regularly did – check Halifax buses in Leeds. The middle section of the 508 route also passed through a significant sector of Bradford too, but I don’t ever recall their inspectors ever boarding. The problem in the evenings was that there was only one inspector allocated to ticket checking duties, and even then they would always use the flimsiest excuse to seize the opportunity to avoid going out ‘on the road’ if there was a nice little warm office job that could be found. Even then, if they did go out the service had been reduced so much that it was no longer possible to just hop on and off buses at random, and most had a set sequence of bus journeys and connections worked out that was the same every day. Consequently all the drivers knew what trips they would board, and more importantly which they wouldn’t. One particular inspector had his checking sheet written up in advance and would spend a considerable time in the late afternoon going through the sheets to ascertain which drivers would be on which trips. Then over teatime he would sidle into the staff canteen and seek out these various drivers, sit down alongside them and start up a friendly conversation. Then he would quietly ask them to verify they were on a particular trip on his sheet, then slip it beside their their dinner plate, point to the appropriate line and say "Just sign there – save me a job". All being well he would gather signatures for every journey, then of course not bother leaving the office all night ! Either that, or he would slope off home for a few hours. We shouldn’t have signed of course, but then they always had ways of getting their own back if you refused. I have to confess a bit of inexcusable naughtiness on my part. There was one particular inspector who did go out checking and always started out boarding my regular first trip after tea – the 1850 508 Leeds. He would ride to the lower reaches of Northowram where he knew he could then cross the road and catch the inbound 508 back to Stump Cross, then on to a 549 Brighouse and so on. My trip was always lightly loaded out of town, but this chap was a bit of a chatterbox and would stand at the front yacking on about this and that. I would deliberately drag my heels up the road and divert his attention from checking his watch and looking out for the inbound bus. Nine times out of ten I would be able to manipulate matters so that he missed his connection and he would then have to get off and wait ages for the next one – his evening’s entire plan totally fouled up ! Yet he always fell for it. As far as checking Leeds Bramley drivers running early, Halifax inspectors’ prearranged plan did not include their trips as they didn’t ‘fit’. Though the first time point at Shelf was within Calderdale, the ones at Odsal, Dudley Hill and Stanningley Bottom were in Bradford (where nobody wanted to check) and the one at Bramley Town End was in Leeds. The worst trips for running early were their last two from Halifax at 2220 and 2250, after which they ran to Bramley Depot – in fact the last one terminated at Bramley Town End and ran straight in from there. During the daytime on the 508 it was laughable the way that once past Stanningley Bottom going towards Leeds, the Leeds drivers upon spotting a 508 catching them up would slow right down to a crawl and then pull in at the next stop, irrespective of whether there was anyone boarding or alighting. They would then remain there until the Halifax driver passed them. If I had to pull in myself to drop off, and stopped behind the Leeds bus, they would still not move off, and if necessary would just pull forward a few feet, then wave me past. They used to do it to one another too, and it was not unusual to see maybe three assorted Leeds buses parked up waiting for each other to move, or just crawling along at 5mph in a convoy – all waiting for a 508 to pass them and clear the road. Halifax drivers were different altogether and couldn’t be bothered with all this dawdling and work avoidance, so we just used to whizz past and get on with it. What fascinating and slightly worrying information, Chris and John. If timetables were so blatantly disregarded and bunching so common, is it any wonder that many bus users said "enough’s enough" and bought a car? It would be understandable if traffic was the cause of bad timekeeping, but such "Spanish practices" (if I’m allowed to say this phrase nowadays) showed a disdain for the passengers. You and Chris were obviously true busmen, but some of your colleagues did a huge disservice to the industry and certainly helped to perpetuate the downward spiral of bus use. Gosh John, now there really are some revelations there and its safe to say that with the Chief Inspector at Leeds, the tyrant I mentioned – others in the post were fair but stern, the Halifax inspectors would never have got away any of that Luddite activity and forgery. On another point, perhaps the Bradford inspectors were only permitted to board Leeds CT/Metro buses on the two joint services 72 and 78?? Sorry to nitpick John but Stanningley Bottom was and is well within the city boundary of Leeds and their inspectors should have been actively checking tickets and time keeping. Chris H – you are correct regarding the current Leeds boundary but psychologically Stanningley Bottom was, since tramway days, always considered to be the boundary between Leeds and Bradford. To be pedantic, the correct name is Stanningley Bottoms. I first heard this used when I travelled from Leeds to Stanningley on a Hebble Regal 3 saloon. Thinking I had boarded the wrong bus, the conductor announced "First stop Stanningley Bottoms!" which, for a ten-year old, I found highly amusing. I hadn’t boarded incorrectly, of course, as I wanted to experience the thrill of riding non-stop all the way up Stanningley Road even though this involved a lengthy walk home. Those old fare protection arrangements limited the choices for some, but gave a much speedier ride for many others travelling further distances. This advantage is now largely lost as most interurban services stop at every road end and penetrate every sprawling housing estate regardless of potential usage. Until 1974, of course, Stanningley was effectively split within Leeds, Pudsey and Farsley which must have been a nightmare for village life. The old boundary with Leeds was a few hundred yards east of the Bottoms (which was part of Pudsey). Local government reorganisation had many faults but at least it unified this community. One point is that blatant early running must have led to very low passenger loadings, and examination of receipts over time would tend to suggest that particular services, or even whole routes, were surplus to requirements. I spent many years in the bus and coach industry, and have to say that an unholy alliance of obstreperous (and militant) drivers, undisciplined supervisory staff (as set out above) and indifferent and incompetent management are largely responsible for the self-destruction of the bus industry. I have heard many times the comment "This would be a good job if it wasn’t for the passengers" only half tongue in cheek. It is fashionable to poo-poo the word customers when referring to passengers (and it is true that this is often used insincerely to try to pull the wool over said customers eyes) but I have the notion that if more basic customer care had been used when passengers were there in plenty then perhaps they wouldn’t be so scarce now. It is unfortunate that many in service industries in the UK are unable to distinguish between "service" and "servile". Very well summed-up, Malcolm! It reminds me of the attitude in many shops, not very long ago and I am amazed that some of them survive, where staff had the attitude "If we’ve got it, it’s on the shelf. If it isn’t on the shelf, then we haven’t got it." However did the management let the staff get away with it? Way back in 1972/3 I applied for a job as a Schedules Clerk with Leeds City Transport. Glad I did not get it. We shouldn’t forget the Traffic Commissioners, either, acting as arbitrators among competing operators when any changes to routes were applied for by one of them and, seemingly, usually keeping the status quo, with nobody ever considering what would serve the customer better! To some extent I agree about the Traffic Commissioners.However on the bus scene some protection was (and is?) desirable to protect the network so as not to concentrate all operators on the same lucrative routes. One of the unfortunate by-products of deregulation was the ending of the often used principle of cross-subsidisation where many operators partially subsidised unremunerative routes to preserve their commercial position. When opened to full competition this became an expensive exercise and so it has led to curtailment of services and ever-more expensive subsidies to keep the minimum of service levels. It should be noted that the predictions by the pro deregulation brigade of free competition and lower fares/better services have never come to pass – and the alliance of nominally competing groups have a monopoly that NBC could never have dreamed of. Most of my experience has been in the coach industry and there the Traffic Commissioners activities were really restrictive. There was little or no opportunity to innovate. Objections to linking of licences often meant that some towns and villages had almost no excursion provision, and attempts to serve special events always led to objections by the express operators even where a day return facility did not exist ! Experiments to tap new sources of traffic or innovative destinations were almost impossible.Now that the major operators have mostly opted out of "occasional" coaching the opportunities are theoretically there, but the potential customer base is now so small that it must be difficult. Creating excursion traffic is hard work, and requires real flair and many man-hours. The "regional companies" (NBC parlance) were happy to get the revenue but I think in many cases they saw the work required as a distraction. Early deregulation of the excursion business together with an even earlier ditching of the silly (and unenforceable) separate fares rules would have led to a much healthier outcome. I recently came across this photograph. I know very little about its history with Hebble, but it is familiar to me – after sale by Hebble, this and an identical vehicle AJX 281 were both acquired by an operator very local to me at the time, Makemson of Bulwell, Nottingham. CRR 92, a 1936 AEC Regent new to West Bridgford UDC. Neither of the ex Hebble Regents lasted long with Makemson, both were withdrawn in the second half of 1962, and were sold for scrap to a local dealer/showman. Hopefully the Yorkshire based correspondents will know its earlier history, and the location of the photograph. This photo just got me in the nostalgia department Bob! One of Hebble`s Regent 111s, in Chester Street Bus Station, Bradford, probably some time after 1956. It is the starting point (or was!) of the 19 service from Bradford to Bingley, via Allerton, Wilsden and Harden, a service I rode on regularly. The route was regularly served by the Weymann bodied Regal 11s of 1946, until their withdrawal c.1956. The 19 service followed BCPT Trolleybus 31 route as far as Allerton, and provided an alternative for us trolleybus enthusiasts to sample, as did the West Yorkshire route to Denholm and Keighley, which followed a similar route out of the City as far as Four Lane Ends, and thence with the 7 trolleys to Thornton and beyond. Many a time have I ridden on this bus and her sisters when visiting a well known hostelry at Wilsden, known a " t`Ling Bob". Nostalgia here too John – for I used to greatly admire these lovely vehicles as they occupied the stand in King Street, Leeds next to our Samuel Ledgard terminus for Horsforth, Guiseley and Ilkley. The Hebble vehicles left at 20 and 50 minutes past the hour on services 15 and 28 to Rochdale or Burnley. Can anyone today imagine the wonderful scene in King Street each weekday between 1715 and 1730 – passengers then were plentiful. Two Hebble buses (one duplicate) left at 1720, leaving room on the stand for no less than four Samuel Ledgard machines for the 1730 to Ilkley thus – 1727 to Rawdon, 1728 to Guiseley, 1729 to Ilkley, 1730 to Ilkley. Those were the days and no mistake !! I imagine Chris that the current 508 route is the "fag end" of Hebble’s 15 and 28 services. The 508 takes over an hour to get to Halifax; do you have any old timetables which might show how long the 15 and 28 took to get to their destinations in Lancashire? And did the Burnley route go over the top via Heptonstall and the Sportsman Inn or did it go via Todmorden and Cornholme? From my June 1965 Hebble Timetable. Route 15 left Leeds 17:20 and via Halifax 18:18 – Heptonstall Slack 18:56 – Sportsman Inn 19:15 and arriving Burley at 19:38 – 2hrs 18min later. Route 18 Left Leeds 17:50 and via Halifax 18:45 – Ripponden 19:03 and arriving Rochdale at 19:41 – 1hr 51min later. Yes Dave, the 508 which was instituted by the PTE, was indeed the Halifax – Leeds section (or fag end) of the Hebble services. I say "was" because in recent times service revisions appear to be endless, and the 508 has been re-routed in Leeds away from the City end of the A647 Armley Road. It now uses the A65 as far as Kirkstall and then goes via the old Leeds and Bradford Road and Farsley before rejoining the A647 at Stanningley, then as before. Thanks to Peter for the Hebble 15/28 details which I did not know – I do though just recall from King Street days that one of the displays showed intermediate points as "Dudley Hill, Halifax, Littleborough – I think !! Thanks for the interesting replies, Peter and Chris. The 508 was re-routed when the 15 Bradford to Farsley service was withdrawn a couple of years back. It provided an extra service to Farsley (though not from Bradford centre) and the 72 frequency was increased to compensate for less buses down the A 647. A 508 leaving Leeds now at 17:35 is given 1hr 29 mins to reach Halifax. A 592 leaving Halifax is given 1hr 25 minutes to reach Burnley, so add them together and you’re just short of 3 hours – such is progress! I suppose back in 1965, whilst the vehicle would be slower, there wouldn’t be as much traffic around and if double deckers were used, the service would be crew operated. It’s not a direct comparison though as the routes don’t totally match each other. 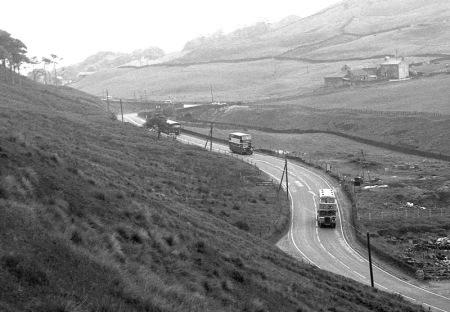 I travelled regularly on the Burnley/Rochdale to Halifax sections of these routes back in 1965-70 and don’t remember seeing double-deckers in use on them anywhere west of Hebden Bridge. Usually it was Weymann Hermes/BET style saloons, although on one occasion I managed to talk myself on board a Hebble Bellhouse Hartwell Landmaster serving as a duplicate – in theory only for passengers connecting to Yelloway’s overnight departure to Torquay. The Landmaster then went "on hire" to Yelloway. Am I right in thinking that one of these wonderful coaches survives? This photo and the comments bring back happy memories from my childhood. One of the joys of travelling by Hebble on the 15 or 28 from Leeds was the (usually) non-stop thrash to Stanningley Bottom. This was the result of the then very common revenue protection arrangements enforced by Leeds City Transport within their boundaries. To a twelve year-old lad, the pleasure and novelty of overtaking LCT buses on Armley and Stanningley Roads was always appreciated and a fitting end to a day’s train spotting, even though Hebble’s first permitted stop was well beyond our usual destination. In keeping with our childish mentality were our giggles when being asked by what was probably the first Asian conductor I’d encountered, "Are you sure you want this bus – the first stop is Stanningley Bottoms!". These services have an interesting history. Road service licensing meant that, as Todmorden already had services in the valley, Hebble had to be content with getting to Burnley through Heptonstall. This was a route not suitable for double-deckers and in some winters not suitable for buses at all. They provided an hourly service though for the sheep to watch – there was little in the way of traffic on this section. The Rochdale service had a variety of operators including the LMS Railway from Rochdale to Leeds. That was hourly, again with single-deckers, in this case due to low bridge in Littleborough, although the Rochdale to Halifax section was half-hourly on Saturdays. It also included a through journey to Llandudno on summer Saturdays, just slightly west of Rochdale. When Calderdale JOC was formed Halifax, Todmorden and Hebble became all part of the same organisation and a rationalisation of services ensued. The service to Burnley via Heptonstall became two journeys on a Saturday and through traffic was dealt with by linking the Halifax to Hebden Bridge and Todmorden to Burnley services, supplemented with an express Leeds-Burnley service, the 8. The express service was not successful and was truncated to a Leeds to Halifax service, the 8 which became the 508 under the PTE numbering scheme. Up until 1976/7 it was worked exclusively from Halifax but then operation was shared with Leeds, just in time to allow some of the last surviving buses in Leeds livery to work it – I have a picture of Jumbo 491 in Halifax on it. The Rochdale service became really exciting in Halifax ownership. The existing 28 ran every two hours and alternated with a new 27, which turned off at Triangle and passed through Soyland and Mill Bank before rejoining the 28 near Baitings reservoir. The 27 was a lovely run along hilly country lanes but made exciting by the fact that for all the detour, it didn’t have any more running time. The Leopards used on it gave a very spirited performance. I used to love riding on it and more than once had Tony Blackman at the wheel, which was even better. After deregulation the Rochdale services were operated by Yelloway and saw such vehicles as Plaxton-bodied Reliance coaches and National 2s. I used to use the 508 when I was at Leeds University to get back from Halifax (and beyond) after a pub crawl as you could get back later from Halifax than most other places. David, your comment reminds me of the time when Leeds began to operate the 508 service out of Bramley depot. Its difficult now to imagine how very "parochial" the Leeds operation in general was in those days – even those drivers aware of the long distance journey to Bradford were looked on by the rest as brave explorers. When the Halifax participation began only a limited number of drivers were familiarised and they became celebrities almost overnight. I was once "showing up" (spare) in Leeds Bus station with an AEC Swift and a conductor when a harassed inspector enquired of the several crews if anyone knew the way to Bradford as there was a serious hiatus in the frequent service – I volunteered immediately with glee, and was looked on by the others as a "double agent" who’d let the side down and broken up the card school. I enjoyed the trip immensely, full load all the way there and back, and managed to handle all the usual passenger jibes "Thought you’d gone on strike" etc – the young conductor was not amused at all – no stamina some of them you know !! I once caught the Rochdale – Leeds service in Calderdale days. The steed was a Weymann bodied Leopard which gave a good account of itself .However it was a chilly spring evening and the rubber edging on the door was somewhat frayed and the ensuing draft assumed Antarctic proportions on the tops . Like many Calderdale buses the Leopard was fitted with the unusual and eccentric method of change giving whereby the coins rattled down a chute to the right of the passenger The journey cost me 40p at the time what a bargain! Incidentally First ran a short lived direct peak hour Leeds – Halifax direct service numbered X8 which has now ceased. I’ve been wondering exactly the same as Neville Mercer about the Hebble Royal Tiger/Bellhouse Hartwell. 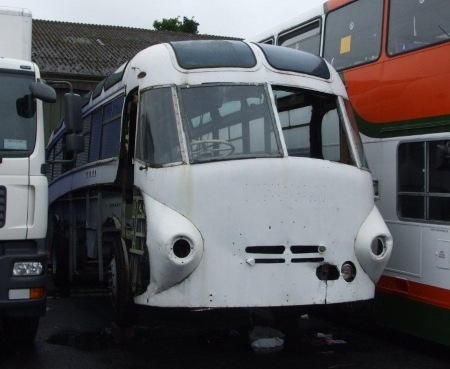 It was ECP 500 and apparently someone made an appeal to Dewsbury Bus Museum to see if it could be saved but that was well over a year ago and as nothing has been heard since, I fear it has been lost. A very sad event if so because I thought they were wonderful machines, they exuded fabulous Fifties flamboyance! I agree with Chris Barker that it would be a tragedy if the Landmaster has been scrapped. These were never that common – the only other one I ever managed to ride on was an AEC Regal IV belonging to Meredith & Jesson of Cefn Mawr. M&J frequently used their example on their stage service to Wrexham! I fear that if the Hebble machine has indeed gone, then the glorious BH Landmaster is now extinct. Where on Earth are people’s priorities when there are hundreds of Routemasters still in preservation? Thank heaven for far-sighted preservationists such as Roger Burdett and the Ementons who bring a bit of welcome variety to the preservation scene. Gentlemen – thank you for filling in the information on this Regent’s Hebble days, I’m pleased you found the photo of interest. One question though – why is the bus parked with its offside nearest the platform/bay/stand – was it normal practice, or a one off? Also there has been mention of the Hebble Royal Tiger ECP 500, below are a couple of shots as it was when I photographed it in Lancashire in August 2008. …..and there was also the Sheffield United Tours pair of 1955 Reliances. They seemed to be an extra order and the bodies were apparently cancelled by Blue Cars and originally intended for Leyland chassis. Blue Cars already had examples. Apparently the Landmaster was due to be scrapped, but at the eleventh hour it was reprieved when Ensign agreed to take it on. Having seen some of the restoration jobs they have undertaken, this was a great relief, but I am told that even they decided that it was beyond redemption, and that it may well have been scrapped by now. I hope not, as it would be a tragic loss. I have a feeling that I read somewhere, not so long ago, that Ensign had been approached to save ECP500, but had declined because of its stripped out condition and its frailty, making it too tricky to tow. To answer Bob Gell’s latest question – Chester Street Bus Station (but not the through road down the middle) operated at this time as “one way” for buses. Thus they all entered via Little Horton lane and exited via either Great Horton Road or (in the case of buses heading back up Little Horton Lane – The Sheffield 66 joint service and certain Hebble Routes) via a loop on Wilton Street past the morgue and thence back up Little Horton Lane. The non West Yorkshire side had two stands – on the side pictured there were the Hebble Stands for the 7 & 17 Halifax services, the two Hipperholme (26) routes (where AJX 245 appears to be heading as far as I can tell from the blind), and the Bingley 19 service via Wilsden. Additionally there was the joint Yorkshire Woollen and North Western X12 Manchester service. Any remaining space nearer Little Horton Lane was taken up with spare West Yorkshire vehicles between turns. Interestingly these were parked against the traffic flow – presumably so that they could regain the West Yorkshire half facing in the right direction ready for their next run. Thus all these service buses loaded on the live bus carriageway. On the other side of this half there were stands for the Sheffield 66, (joint Sheffield’C’ Yorkshire Traction and Yorkshire Woollen.) and also the Samuel Ledgard Leeds via Pudsey Routes. These loaded from the kerb. On the West Yorkshire half, all routes with the exception of the 67 Keighley/Skipton loaded in the middle of the bus carriageway as they were parked “herringbone” either side of the Green Hut. All passengers for these routes had to cross the bus carriageway to join their buses. All in all the place was somewhat hazardous for passengers to say the least. I think things were remodelled sometime in the late 60’s. Returning to AJX 245 it was bound for Hipperholme Crossroads via Wibsey. There were two routes 26 and 26a, one branching off just after Stone Chair at Shelf to run through Coley village with other keeping to the main road through Lumbrook. There was a short working for a time to the edge of the then new Bradford Council Buttershaw Estate which displayed Boltby Lane – running I recall at peak hours only. This was discontinued when Bradford Corporation built a trolleybus extension into the heart of the Estate. One other interesting bit of information is that there was a through route to Halifax (29) that ran on this route from Bradford as far as Shelf thence to Halifax – for some reason on Saturdays only. It was termed the “Wibsey Flyer” – its route was marginally shorter than the main routes through Queensbury or Odsal/Shelf and Hebble drivers always liked a challenge. 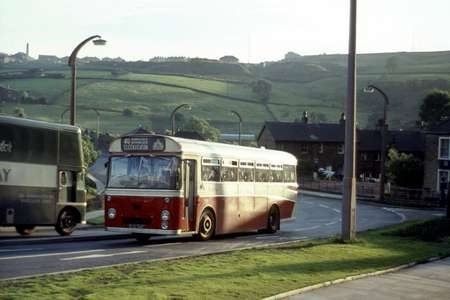 And finally I used to visit my Sister for lunch once a week – she lived in Allerton on the Hebble Route 19 from Bingley. I always used to catch the Hebble back into Bradford, I reckon it could shave at least 5 minutes off the 31 trolleybus – rarely stopping at all after the Chapel Lane stop in Allerton. As I said the Hebble drivers liked a challenge ! The Samuel Ledgard (formerly B & B TOURS) buses for Harrogate also departed from the "West Yorkshire" side of Chester Street Bus Station. Their route was identical to the WYRCC 53 service except that "the blues" deviated from the main road at the Hare and Hounds and additionally served the full length of Menston Village. What a shame to think that ECP 500 has survived so long only to be lost so recently. Whilst in a poor state it doesn’t look so dreadful compared to some restorations. I managed to find a photograph of it taken in 1976 and better times when it appears to be in fine condition. 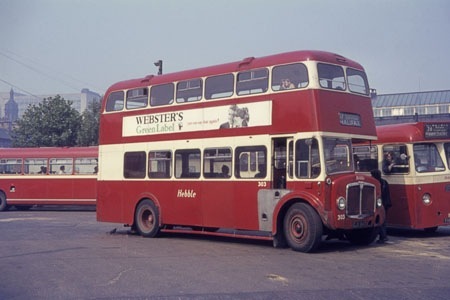 To sort of illustrate Chris’ memory on this thread (which seems to be unravelling into about three different themes) the attached picture shows the bus he was referring to, which was Calderdale 357. This one lasted quite a while in Todmorden livery and I’m pretty sure was the last to carry it by some margin. This picture is taken near Cliviger, between Todmorden and Burnley, a location much better known to railway enthusiasts as Copy Pit and a bit of a shrine in the very last days of steam. What it shows is a Halifax PD2 on the 8 from Burnley to Leeds, with 357 behind on what I recall as a duplicate. Behind that is a Ribble Leopard on an express service to Manchester. I love your comments, Farmer G, about the speed of the Hebble 19 service! They were flyers alright, especially before the route was double decked. Swirls of dust and dead leaves in their wake! West Yorkshire, down Thornton Road were just as exciting sometimes, even with 5LWs, but one of the reasons was the longer spacings of bus stops, and the penny surcharge in the City boundary, which got them to Town quicker, but which most thrifty Bradfordians did not experience because of said surcharge. Mind you, the old "Regen" trolleys could move a bit too! Memories of hurtling down Thornton Road, from Spring Head to Bell Dean come to mind. So much for "silent trolleybuses"! They made more noise than a Hebble and a WY combined! What a superb photo David B! When was it taken, early PTE days perhaps? Sorry – I forgot to add a date! It was on 17th June 1972. 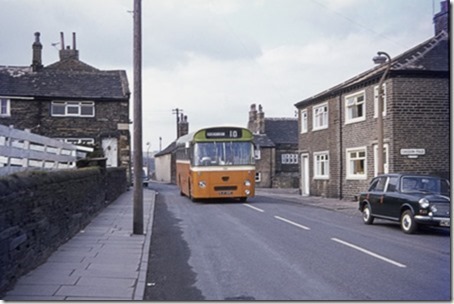 I well remember the Hebble service over the tops to Halifax in the 1960s–used to use it on Saturdays to call at the Sportsman for a few jars–great service–do any buses go over the tops these days? Hard for me to check as I left to live in France when I retired. I lived in Northowram and when the Bradford service was routed via Stone Chair and Landemere under Calderdale, we often had to give directions to drivers who previously stopped at the Northowram boundary or at least, only knew the main road between Bradford and Halifax. They would fly down the hill from Stone Chair only to find around a slight bend at the bottom that there were passengers standing in the road (no pavement). The drivers were none too happy in trying to pull up a Fleetline in short order! John, I was once involved in a collision on the ‘slight bend’ you mention, which was towards the bottom of Score Hill and just above Landemere Syke. If they were on time, opposing buses were due to pass one another in Score Hill, so could easily meet on the bend. There was a stone barn belonging to the adjacent farm on downhill side, right on the bend, severely restricting visibility, so one quickly learned to scan the view ahead over the top of the farm from much further back – whilst travelling along Northowram Green (outbound) or from the top of Score Hill (inbound). Though it was not an official instruction, the regular drivers’ convention was for the inbound bus to slow right down or stop half way down the hill until the outbound one had safely negotiated the corner. One weekday afternoon I was outbound towards Bradford in an ex-Halifax Fleetline. I did the usual scan ahead and could not see a bus descending the hill, so I proceeded and approached the bend with great caution. Unfortunately, whilst I had been passing through the blind section of the dip at Landemere Syke the inbound bus had come over the brow of the hill and was hurtling down it rather too speedily. The weather conditions were dull and drizzly, so the road surface was already wet, but the fact that the farmer from Wall Nook Farm had earlier herded his cows down the road meant that there was a lethal coating of slippery brown stuff too. As I very slowly rounded the bend I then saw the bus – another of the same type – coming towards me and so stopped immediately. The other driver had only passed out of the driving school a few days before and must have panicked, hitting the brakes hard. It went into a lengthy skid – totally out of control – and as Fleetlines would do in such instances went into a front wheel skid on the bend. I instinctively accelerated to the left to avoid being hit head on, and the bus collided violently with my front offside then bounced off in the other direction and buried itself in the barn wall, virtually destroying it. Strangely I felt quite calm, and was about to leap out to check if the other driver was injured – fearing the worst. I raised my arm to brush a fragment of something from my hair, and my conductor Ken got into a bit of a state and shouted at me not to move, and not to touch my head – pointing at it anxiously. I looked in the mirror and there was a very large triangular-shaped section of my offside cab window glass stuck into my hair in an upright position – like a kind of glass Mohican ! He’s assumed it must have been buried into my skull, but I just flicked it away without any red stuff gushing out, much to his relief. Miraculously neither the other driver nor any of our passengers were injured. Police and our inspectors and engineers were soon on the scene, and the other bus had to be extracted and towed away. Our inspector – the late John Davis – having knocked out the remaining broken glass from my side windows and twisted off various bits of metal trim and the odd panel, deemed that my bus was fit to drive, and decided that the other badly shaken driver should drive it back to depot under his supervision, fearing that otherwise they would go home and never want to drive again. That would most certainly not happen nowadays, but fortunately he was right and the driver did carry on and drove for a few more years. The barn was eventually rebuilt, and ever afterwards each time I passed it I could not help being reminded of the incident, and of what might have been. A very ‘interesting’ tale, in more ways then one, John. The scary thing is seeing things unfold and it was quick-witted of you to get your bus moving so quickly when trouble approached. The amazing thing is that the barn was rebuilt, so perpetuating the very danger that caused the accident! 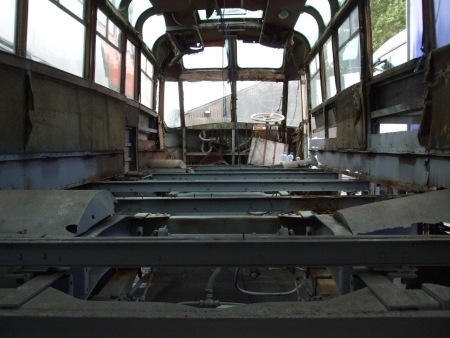 More on the Hebble Halifax to Burnley route. When I began drinking, the Shoulder of Mutton at Blackshaw Head was a lively place with bands on every Friday and our friends place to be for years. We used to meet in Halifax at the Bulls Head, then catch the 7-30 pm Hebble. It used to "fly" down the Calder Valley and we were usually at the pub soon after 8 pm. Going home was more difficult at the last bus was while the band was still playing as the pub stayed open very late. You had to see if you could cadge a lift off someone or leave early. (Back to Northowram) Happy days! Hebble ran several services out of Bradford. Two to Halifax No’s 7 and 17. Huddersfield 64, Bingley 19. One to Duckworth Lane. Hipperholme 2 ways – Lumbrook and Coley alternate. Saturday only 29 to Halifax via Wibsey and the Bolby flyer peak hours to Buttershaw estate. Several Yorkshire Woollen vehicles were housed in Park Rd. The X12 to Manchester ran a YWD vehicle. A few of my own comments. As to Hilditch having Bradford and Leeds put onto destination blinds, Bradford was on many right back to the 1950s. All the Daimler CVG6 class had Bradford on them, although never running past the Queen Victoria at the Borough Boundary. It was to be found on many other vehicles long before Hilditch took over. When the 7 was diverted to Stone Chair and Northowram Hospital, I lived at Landemere and When Bradford began sharing the route, was called to the bus stop and asked which direction to take the bus. It was common for a while that the driver would shout back and ask passengers the way to go after leaving the main Bradford road. For quite a long time, vehicle inspectors would board vehicles at Crossfield before allowing passengers on and do a check. One time after looking here and there, he forbade anyone to board and directed it to be parked in Gt.Albion St. (AEC Regent V-Weymann). We then had to wait for one to come down off the parking area to take over. As all have said, that last period was appalling for Hebble. Goodness knows what the mechanics thought as people must have been pointing fingers.